The remains of iron 'shield handles' or 'reinforcing strips' (figure A) are well known from a number of first century Roman military sites. These are sometimes fairly plain but many feature bifurcated ends. These reinforcements have been interpreted in various ways, with some authors assuming a horizontal placement to facilitate a horizontal handle and others preferring a vertical position which dictates a vertical handle but which provides longitudinal reinforcement. Usually it seems to be assumed that these pieces were attached to the backs of shields. Certainly this may have been the case with the ones which are known to have measured two feet or less in length and these may well have formed horizontal handles. However, there are good grounds for believing that some of the longer ones (which would have been too long to fit horizontally across a shield) may actually have been placed vertically on the faces of shields. Amongst the shield covers (tegimen) from Vindonissa in Austria one appears to be so far unique in that it retains an impression of the bifurcated end of what appears to be one of these reinforcing strips (figure B). This must be due to the cover having been pressed down over its shield when wet. The impression left however, proves that the reinforcement must have been on the face of the shield rather than the back, as a reinforcing strip attached to the back would almost certainly not have been in contact with the shield cover. This interpretation is supported by the depiction of numerous shields shown on Trajan's column which seem to feature vertical decorations with bifurcated ends on their faces. Many of the more complete handles / reinforcing strips are sufficiently long that to be attached vertically in a central position they would have to pass across the hole where the handgrip would be located. A normal shield boss (umbo) with a flat flange would prevent this from being possible on the face of the shield. This is probably why it has often been thought that they were placed on the backs of shields. However, a copper-alloy shield boss from Carlisle (figure C) provides a solution to how a reinforcing strip could be attached to the face of a shield without being obscured by the boss. The Carlisle boss has been made so that the flange has been worked up into a semi-tubular shape on opposing sides, which would allow a reinforcing strip to pass under the boss without being obscured by it. Two of the four rivet holes pass through these raised pieces. A reinforcing strip passing under the boss like this would allow its central portion to become a vertical handle, which would be firmly held in place by the rivets which pass through the raised pieces of the umbo flange. Although it would probably be possible to combine this vertical reinforcement with a horizontal handle of the type which is used on the curved scutum, such an arrangement would require the fingers of the left hand to be spread (possibly uncomfortably) around the reinforcing bar. If the reinforcing bar formed the handle itself however, it would provide a vertical handle which could allow for a more dynamic use of the shield and, importantly, which would also allow the soldier to grasp a couple of javelins (or a spear and one javelin) vertically behind his shield, as appears to be shown on one of the Mainz column bases (figure D), dating to the Flavian period. A number of auxiliary grave stele from the Rhineland show soldiers with more than one shafted weapon as well. The act of carrying two shafted weapons behind a shield is difficult to achieve effectively with a horizontal grip. It has been suggested that these javelins could have been held in some sort of bracket, but being gripped in the hand would allow for a much more rapid deployment and a vertical grip, as stated above, would enable this to be possible. The Mainz sculpture also shows the shafted weapons emerging from both ends of the shield, further reducing the likelihood of there being a bracket to hold them in place. My speculative reconstruction (figure E) therefore, combines a flat clipeius type shield with a vertical reinforcing strip and the Carlisle umbo (another boss suitable for this use also survives from Mainz), to create a shield with frontal iron reinforcement, which would provide greater protection from damage to the shield from enemy weapons, and a vertical handle which would facilitate the carrying of shafted weapons in a vertical position. 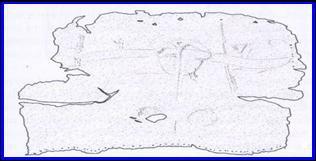 I think that the only disappointment which some members might find with this shield would be that it would be more difficult to carry in a vertical position whilst drilling and marching and so therefore a more horizontal carrying position would probably be preferred as a result. Fig. A: Iron reinforcing strip from Newstead. Fig. B: Tegimen from Valkenburg. Fig. 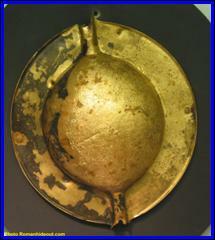 C: Copper alloy umbo from Carlisle. Fig. 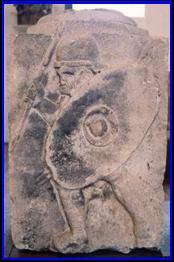 D: Carved relief from Mainz where the soldier seems to be carrying two spears or javelins in his shield hand.